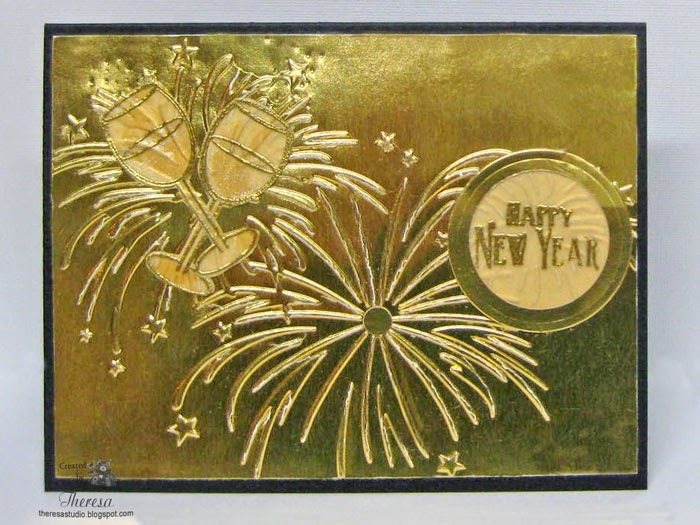 I begin the year 2015 posting this card made with a lot of shine using DCWV gold foil cardstock that I embossed with Darice EF Fireworks. I love the festive look of fireworks. I added some wine glasses that I gold embossed on Vellum and fussy cut. I used Repeat Impressions stamps from their Wine Series. I used a Clear star Pen to color in the wine and make some bubbles but it's hard to see in this photo. I also gold embossed the sentiment from Mark's Finest Papers on Vellum and framed it in a Gold Foil Circle. I used a card base of Black CS. Thanks to all who have visited my blog this past year. I look forward to your visits and comments in 2015. WOW! This is a great way to celebrate the new year, Theresa! Love the gold and fireworks. Happy New Year to you - may 2015 be a great one for you. Beautiful card! Loving all of the gold! So pretty! !